***UPDATED*** with 2011 photos of the Apple authorized reseller below (first photo is from 2007). First two photos (Store photo & Mall photo) © 2007 Wired Nerd, posted on ObamaPacman.com with permission. His photos are available for licensing. Since the recent discovery of fake Apple Stores in China, there’s an interest in ousting other faux Apple Stores around the world. Here’s an El Salvador store discussed in Macrumors forums last year, with additional digging by OP. 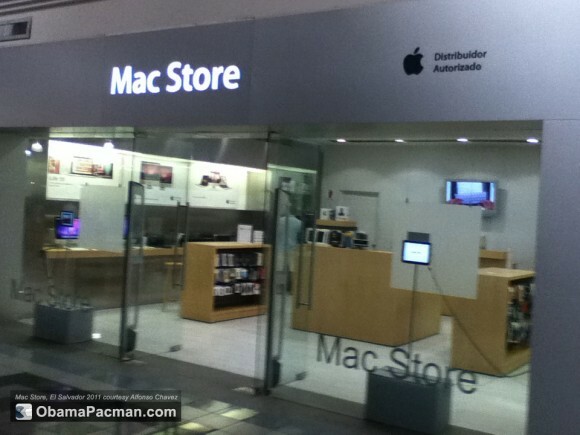 In 2007, the store has Apple logo in aluminum store front, with tall glass windows, and wood tables. Probably one of the best Apple Store knockoff in Central or South America. But despite the similarity in looks, the customer service experience might be (or might not be) different. 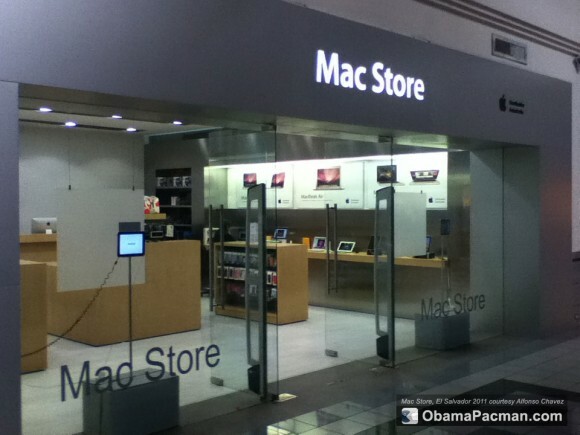 Some people are reported to have poor experience with this fake Apple Store in 2010, but that seems to be two cases. The picture is from 2007, but the fake store is still around in 2011. The “Mac Store” name is said to be removed from the windows at least in 2010 or earlier, so it probably looks even closer to a real Apple Store. It is listed as Mac Store in mall directory though. Currently, the store seems to sell real Mac, (first gen?) iPad, and iPods. The MAC STORE (facebook) is located at the Galerias mall (Centro Comercial Galerías Escalón 3er Nivel, Local # 362), quite a fancy and high profile mall. It is part of Almacenes SIMAN (store page points to them as an “interest), certified Apple reseller. Probably won’t be for long. The store currently uses an email with @mac.com address, which is from Apple MobileMe service. At least the email will be transitioned to me.com email addresses soon due to Apple’s move to iCloud. Apple has no retail stores in El Salvador. It’s quite a surprise that a fake Apple Store could exist for four years. Update, August 4, 2011: Alfonso Chavez from SIMAN send OP the following photos, and claimed that Apple approved the current look. Their Mac Store no longer has a copy of the signature glowing Apple logo. Instead it has “Authorized Distributor” next to a small, non-glowing Apple logo on the store facade. What do you think? Would people still confuse the “Mac Store” with the official Apple Store? This entry was posted on Sunday, July 24th, 2011 at 11:00 am	and is filed under Apple Store. You can follow any responses to this entry through the RSS 2.0 feed. The products might be real but the stories are that fake store’s customer service is poor. People love to copy success, that’s why they copy the Apple Store and NOT Microsoft’s copy cat stores! I request that you remove the article immediately given that its contents are false, and Legal action is our next option. One of your discussion rules is:If it’s illegal in real life, it’s not allowed here. It’s not illegal to point out that your store is an unauthorized copy of an Apple Store. Being an authorized Apple retailer does NOT provide you a license to copy the look and feel of the official store. Due note, this is not Central America where you can try and make threats. The article has valid standing to this date. So, go crawl back to your aristocratic world. The look and feel that you have shown it was a 2007 picture of the look approved by Apple officers at that time. There had been changes in look and feel guidelines since that time and today the store is as compliant as at that time was. Is this hard to understand? you have written something using old information, which makes your article false! Thanks. Updated the article. When did the store change to the current look? Sorry, but this is not an Apple Store, can’t you read? It says Mac Store on the front, it is an authorized store and it has existed as long as I can remember. You know why Apple won’t say a word about this? 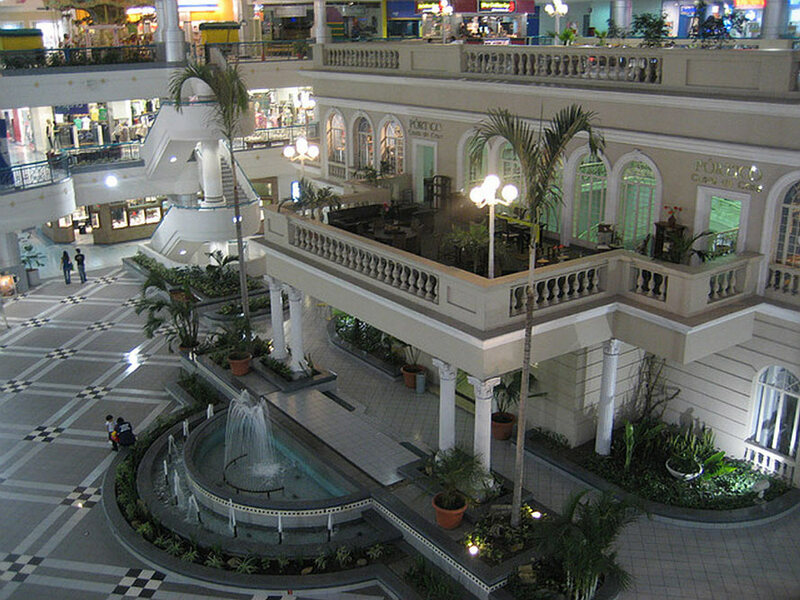 this store is owned and operated by Siman (www.siman.com), that’s Macy’s or Sears equivalent here in El Salvador. Siman’ are a very powerful family in this country and even if you don’t believe it, Apple officers deal with power the same way all over the world. So, at least down here, Siman has the upperhand. Siman’s are the only authorized Apple resellers in the country. But you are right, this is not an Apple Store. For why reason it’s fake? i travel to Panama, Guatemala, El Salvador and all stores are similar you make a post for each? it’s ridiculous. Maybe has a poor customer services, but not justify degrade. If you cover the bottom half of the first phone most would believe they are looking at an Apple Store. So the real topic here is to know if Apple has indeed guidelines for the look of it’s authorized resellers, if they’re no guidelines or requirements, then the post is right by saying that the look of the store is somehow a copy of the look of an Apple Store. But if Apple has no policy against that then there’s not much of a big deal right? 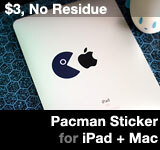 You cannot use registered trademarked Apple logo alone (as seen in older photo of the store). That’s not an apple rule but a general business rule.